Discussion in 'Transformers News and Rumors' started by ScottyP, Aug 29, 2008. Found this at the TRU in Cary, NC today. 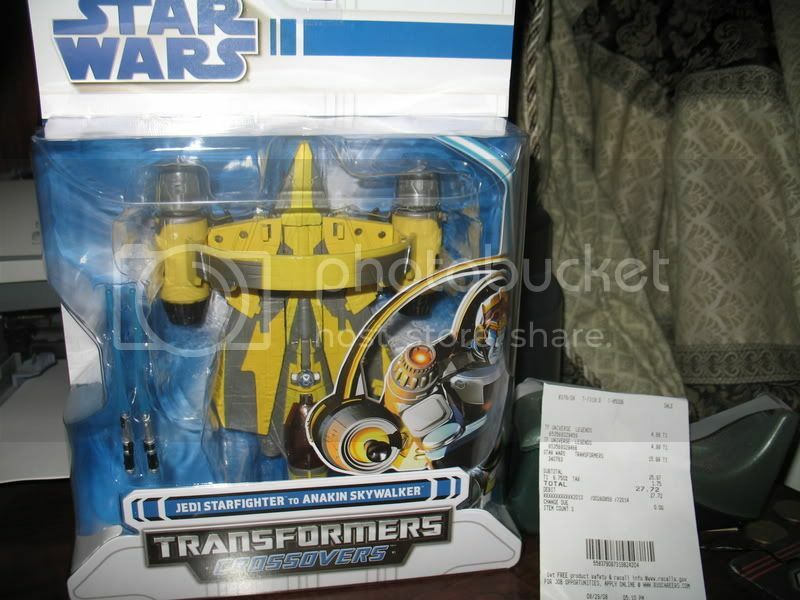 Haven't seen it anywhere, nor did I know it existed (though I only get about half of the Star Wars TFs). If this is old news, please [delete] or [lock]. I don't mind, lol. Awesome. Wave 1 Revision 1 seems to be right on schedule then. This wave should also include a repackaged Luke Skywalker Snowspeeder. Does it have a pilot? along with the old packaging. I don't mind it, they're too easily lose-able. I never lost a Diaclone Humanoid, so why would I start now with SWTF Pilots? Anyway, this "new" line just seems to be more repaints. I'm in favor of them dropping the pilot figures. I think some (but not all) of the design flaws in SWTFs comes from requiring that they have working cockpits. Naw, we're getting a TIE Bomber Pilot, a new General Grevious, and a new Stormtrooper mold that transforms into some SW fighter I can't name. i saw these tonight at my TRU. and a new Stormtrooper mold that transforms into some SW fighter I can't name. V-19 Torrent -- the three-winged ships featured in Clone Wars. Ah. Well, that explains why I couldn't name them, then. Goo news. Tho I still say that the Anakin head mold looks like Hot Shot. I'm still waiting for some other SW characters to get made that are just begging to be done. -An Imperial Captain and Stormtrooper (maybe 2) into a Star Destroyer. I'm surprised that they dropped the pilots... they were one of the coolest things about them. I see a lot of people forget they're supposed to be robots in disguise because the toys have no need to be in disguise, they've got nothing to be in disguise for. Bring back the pilots! Or refit the earlier toys to not have cockpits. I saw those last week at a local walmart. I don't follow the line though, so I didn't know it was news. Easily the best mold from SWTF. Can anybody tell what else is remolded besides R2's location on the ship and anakins head? That'll be the first I buy in the new packaging. For some reason, I'm a completist on the SWTFs. Can't wait for the new molds, though.